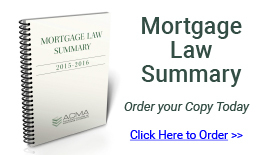 In the first December post on the ACMA Community Blog, Fellow Anthony Carriuolo summarizes an appellate court ruling in Miami that "should raise concern among residential mortgagees and title insurers" because the court's opinion "creates the real risk" that the mortgagee and insurer "may become subject to a tax deficiency and related lien." "Protecting against this risk," Carriuolo concludes, "will be difficult indeed." To read the full blog post and subscribe to the Community Blog, Fellows should log-on to the ACMA website; select "Manage Profile" on the right-hand side of the home page; click on the Blog icon; choose the Community Blog ("What's Up? "); and select "Subscribe" to read the blog posts to-date and receive Instant Updates of future posts. Subscribers also are encouraged to post comments in response to the blogs.